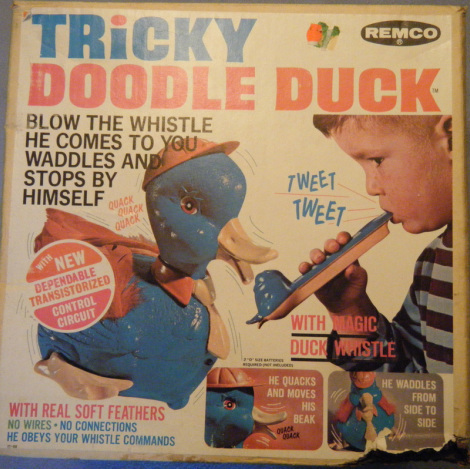 Tricky Doodle Duck is a Remco sound actuated toy released in 1968. 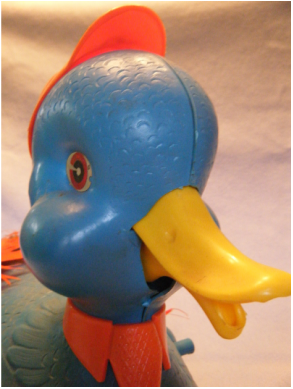 Similar Remco toys include Tricky Tommy Turtle and Tricky Peter Penguin. There was even a Tricky Busy School Bus. They would have sold for around $10-$15 each in the late 1960's. Remco made a "Bunny Baby" doll that responded to a whistle as well. 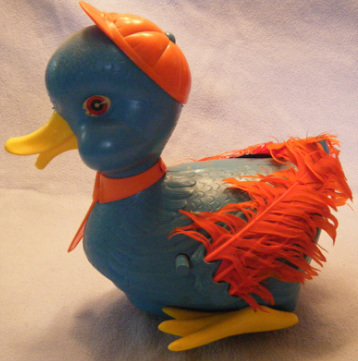 The important things we were looking for in a Tricky Doodle Duck acquisition were: a battery compartment cover, unbroken tie, cap in place, complete eye decals, feathers intact, and the whistle. A box and instructions would be bonuses. We purchased Tricky (sans whistle and instructions) in "unknown condition", which usually translates to "not working" in the case of battery operated toys. We really hoped that cleaning the electrical contacts on the battery cover and inside the battery compartment would be sufficient to get Tricky running. This was not the case. Burnishing the contacts produced no effect whatsoever when batteries were installed. The next most likely problem would be a seized up motor or broken internal wiring. Bypassing the circuitry and jump starting the motor through its contacts would involve opening the body. This would appear to be an easy proposition since Tricky has several screws located around the periphery of his body. As you can see from the rest of this entry, this task proved to be a huge challenge which is likely the main reason that collectors rarely find complete and functional Tricky Doodles. 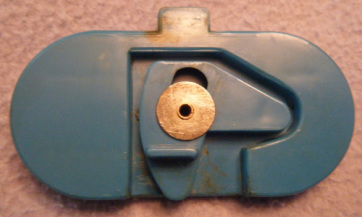 There is a snap in cover on the bottom of the duck that one would assume provides access to the motor. We were were afraid to flex this hatch to pop it out because it was stiff with age. We loosened several nearby body screws to give us enough maneuverability to pop the hatch. 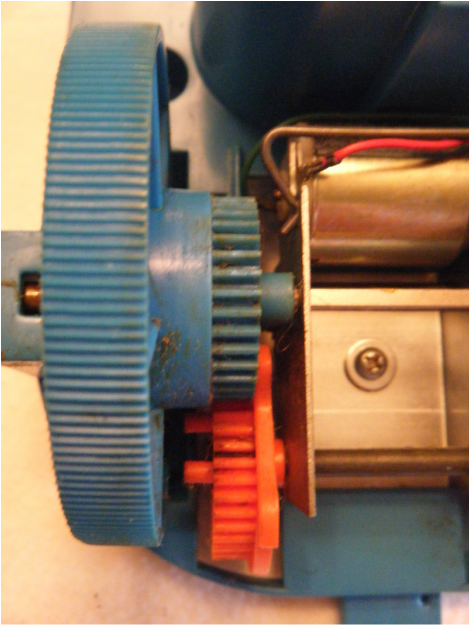 Instead of providing access to the motor, the hatch actually protects the gear train (or keeps little fingers from getting pinched in the drive train). We were disappointed to see that the motor leads were deeply recessed and not accessible. We also found that the gear train was plagued with hardened grease as well as wound up with lint and hair (the late 1960s and early 70s featured shag carpets and shaggy hair). We used needle nose pliers, razor blades, and plastic picks to cut and pull the hair out. We used compressed air to blow out any remaining dust and lint. We were able to get the tip of the clock oiler to the motor spindle and the gear pivots but still not able to attach electrical leads to power the motor directly to test it. Opening the rest of the duck became essential to diagnosing the motor. However, the tie and cap would have to be removed first. We were worried that the stud holding the neck strap of the tie in place would break off during the unfastening process because the tie was hardened with age. 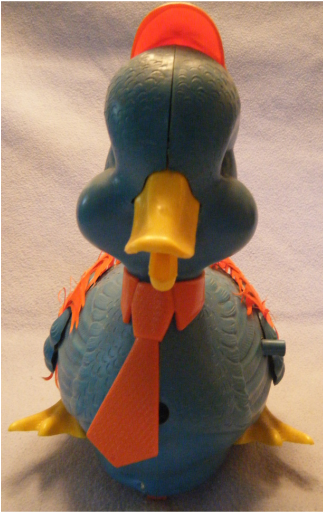 We successfully removed the tie only to discover that the cap was pegged to the head of the duck. Looking at the patent led us to believe that the peg holding the cap in place was just press fitted. We applied a little gentle heat from a hair dryer to make the cap plastic slightly more pliable and less likely to crack. Trying to extract the peg with gentle prying and rocking caused the button to crack off. This allowed the cap to be removed but revealed that the peg was actually cemented in place and would not have come out without invasive surgery. Using a razor saw, I carefully cut down through the peg to align with the seam in the duck hoping to free the two halves and reveal the inner workings. 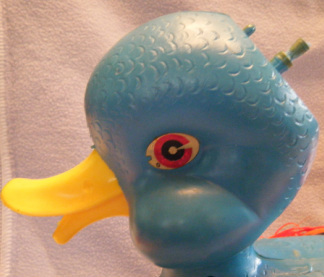 This almost worked but for the fact that the duck is also joined together internally by posts projecting from either eye. The duck was now mostly open and its inner workings revealed. 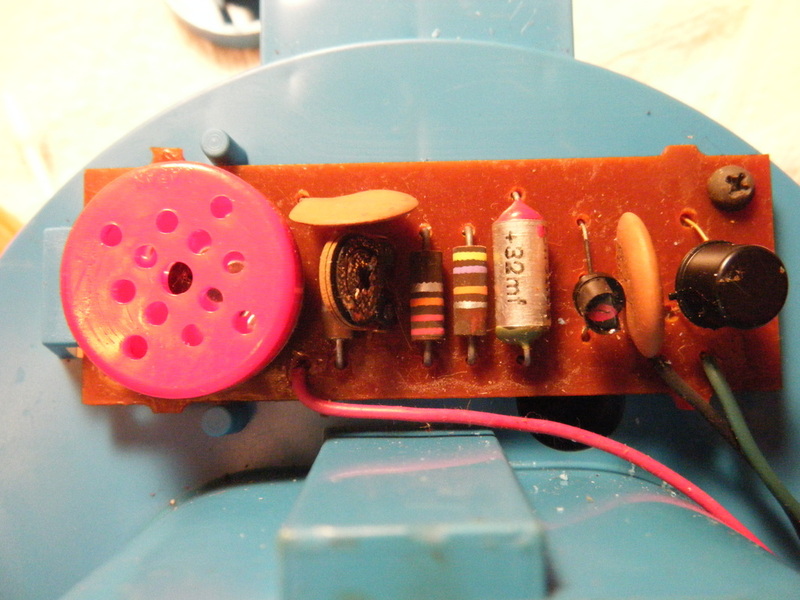 The microphone and transistor circuit board looked fine. The rocker arm and bellows for moving the bill and generating the "quacking" sound looked whole but seized up. The bellows is a possible concern because it looks to be a coated fabric that might have become brittle with age. Applying power to the motor leads caused the motor to spasm and stall. The drive train gears were still seized up. 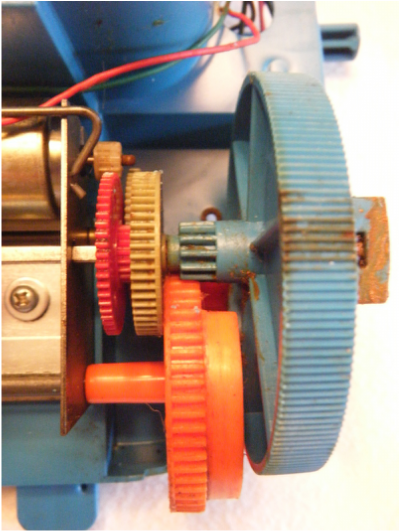 I manually turned the gear train through several revolutions and removed additional hair, lint, and hardened grease. Now the motor turned when powered up directly as well as from the battery compartment itself. I had to stop working on Tricky Doodle before getting the clacking bill and quacking mechanism operational. I don't think I am out of the woods yet and fear that I may have to completely separate the two halves of the duck body to get him fully operational. This Tricky is in good shape; nice eye decals, full feathers, and cap and tie intact. Notice the detail in the molded body. Tricky is a little dusty from storage. Some doll cleaner should restore his appearance. Tricky's lower bill should move up and down when he is operational. A blue aligning pin is out of position just above the tie. A common ailment of Tricky Doodles is body halves that have shrunk forcing the seams to open and making Tricky look "unseemly". The front view reveals that the wings with the feather inserts are separate pieces. 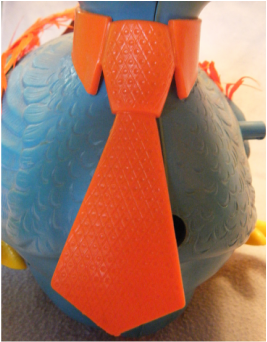 The crescent shaped hole to the right of the tie is a formed opening that is probably intended to allow sounds to pass into and out of the duck. 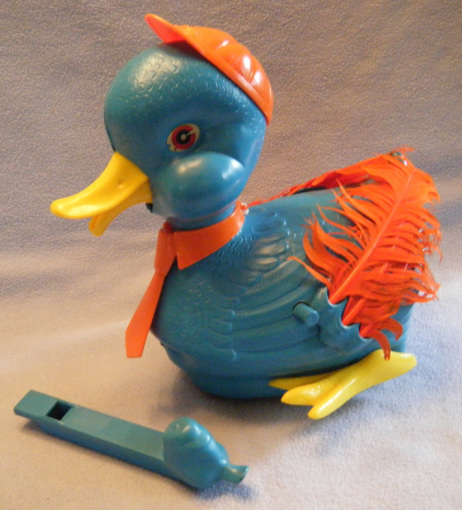 Both the microphone and the quacking bellows are behind the opening. The neck tie has pattern on it. Some Tricky's came with yellow ties. I have not seen any in the two tones like the one on the box's graphic. The underbelly of Tricky. The oblong hole is where the two D cells are inserted. Note that the contacts are at the bottom of the opening. The free spinning red wheel in the front keeps the duck from dragging its belly while waddling. 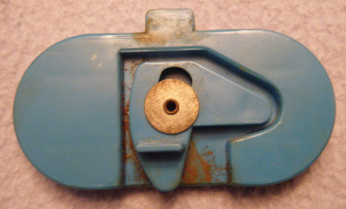 The small circle is a faded inspection tag or possibly a battery direction indicator. The much coveted battery cover. 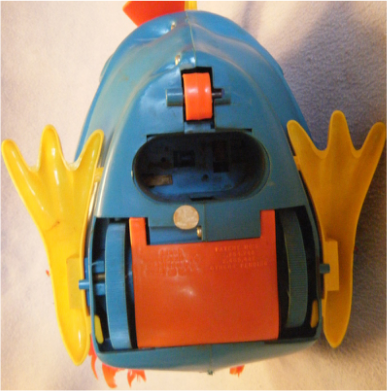 In some battery operated toys the cover is just decorative, hiding the batteries and won't affect the operation of the toy. 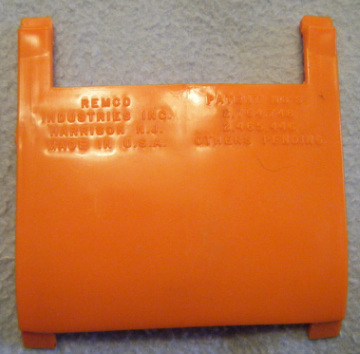 In other toys (like Tricky Doodle), the battery cover actually includes the electrical contacts that provide the pathway between battery terminals. This cover has an unusual design. The corrosion caused by leaking batteries is apparent. Fortunately, the metal has not been eaten clean through and will be able to be burnished which will restore electrical conductivity. Just in front of the wing is a twistable knob. Since we didn't have the instructions we had to figure out what it did on our own. It is the "On/Off" switch. Turning the knob forces an electrical contact to touch a battery terminal completing the circuit. 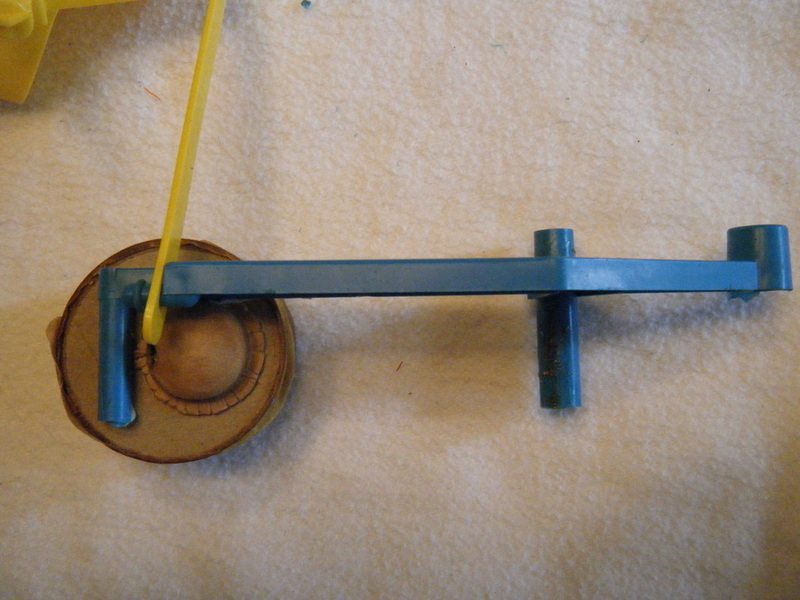 This innocent cap with the blue button turned out to be a real source of grief when trying to open the body to get to the motor and the gear train. The button is glued in which means it needs to be cut free. 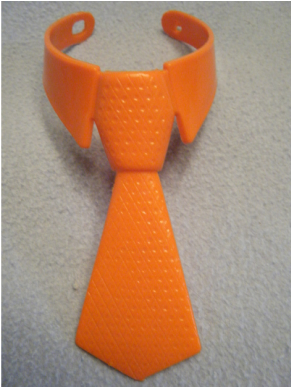 The rear view shows how the neck tie is fastened with a knob and hole arrangement. The indentation on the right side near the bottom is where a screw joins the body halves. Most people would assume that the feet move to create the waddling action. In reality, the feet are fixed to the body and the waddling motion is caused by offset drive wheels shifting the whole body from side to side. This red hatch snaps into position. 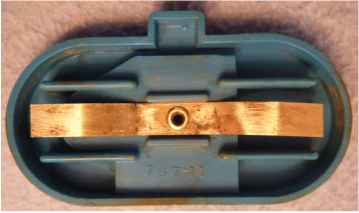 It does not provide access to the motor but instead acts as a shield protecting the opening to the gear train. 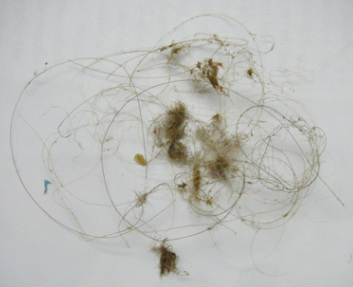 I suspect that the static electricity generated by the plastic body dragging on thick carpet is how all the lint and hair got pulled into the body cavity and wound around the axles. 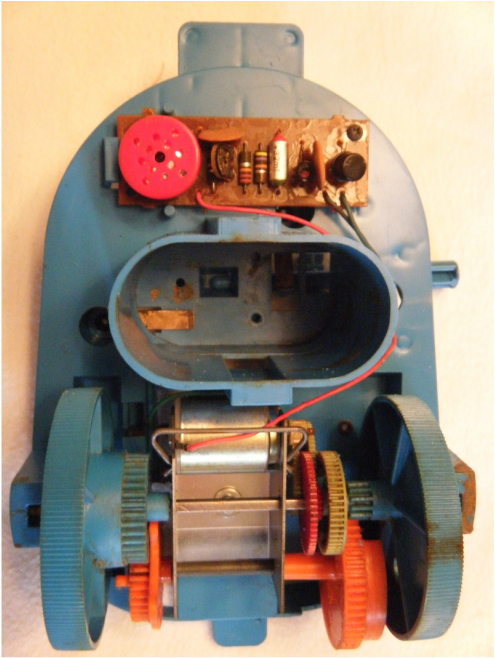 Perhaps this stopped the mechanism and led to Tricky being sentenced to storage (with his batteries in place...). 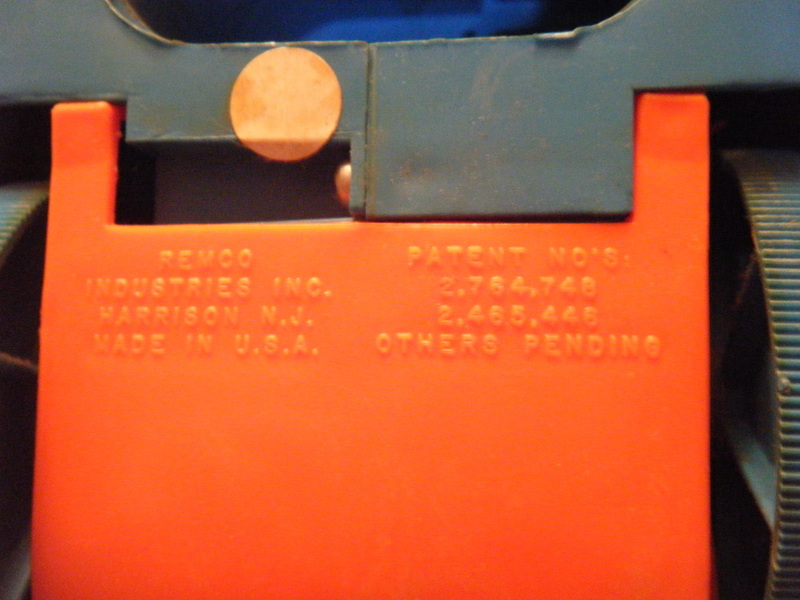 Remco information and patent numbers are embossed on the panel. This is the battery cover after the corrosion was cleaned up. The mechanism can now move. The stains themselves will not come out. 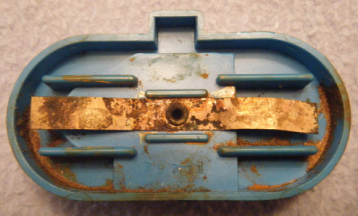 The inside of the battery compartment was also corroded. Getting to the contacts is virtually impossible. 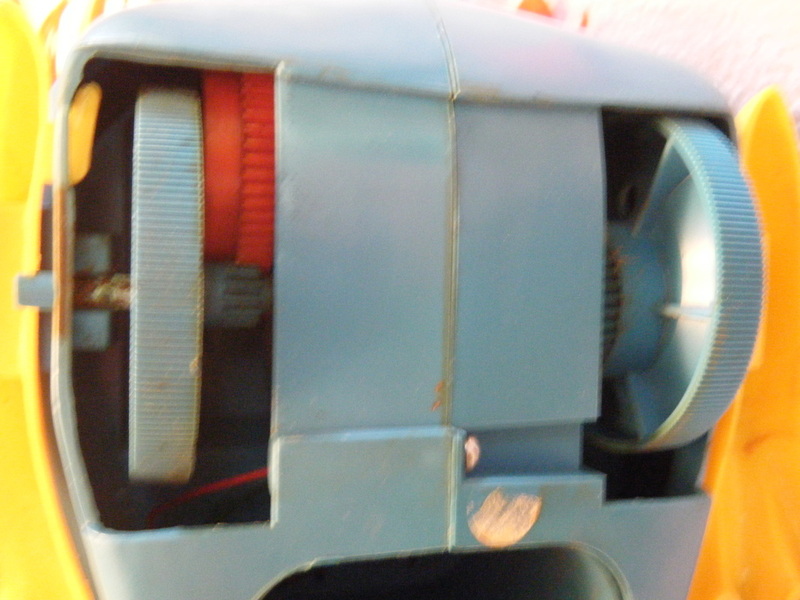 The contact on the right is moved into contact with the battery by a cam on the "On/Off" switch shaft. 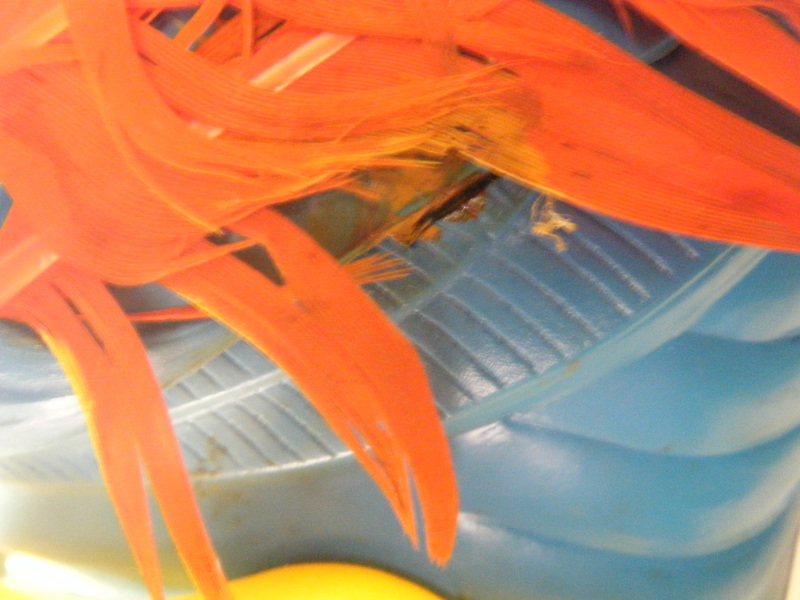 The battery fluids seeped through the opening where the wing is attached to the body and ate off a piece of a feather. The neck tie after being removed. Luckily it came off in one piece. 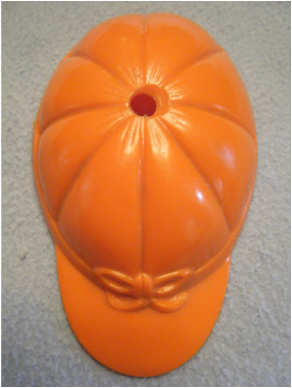 Side view showing how the head looked after the cap was removed. 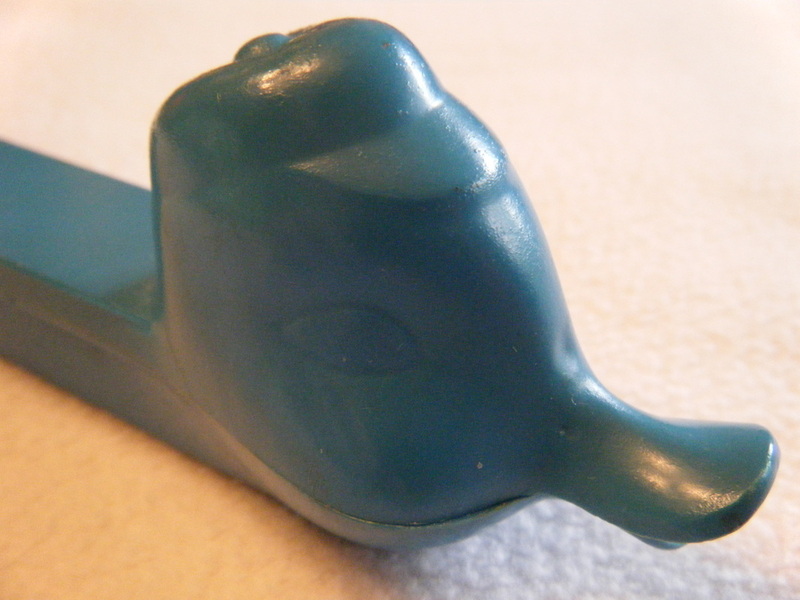 The cap peg is is glued into a formed post in the duck's head. Completely separating the duck into two halves is thwarted by an internal post joining the two eyes. 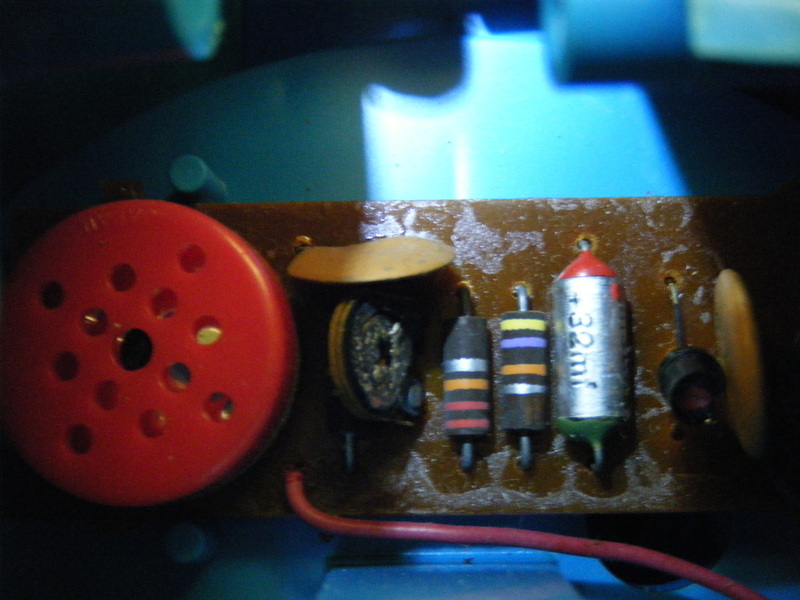 However, the body separates far enough to reveal the microphone (red), capacitors, resistors, and transistors on the circuit board. 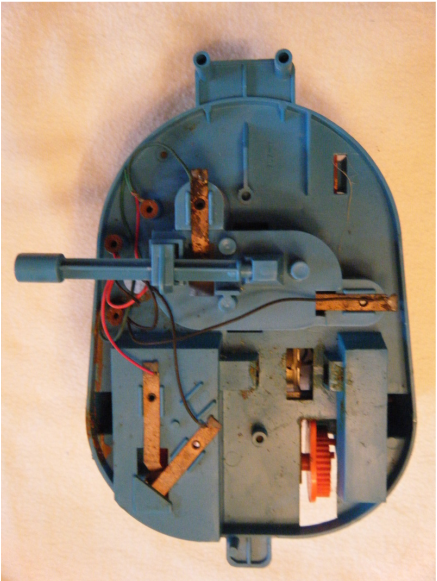 The circuit recognizes the frequency of the whistle, gates power to the motor (making the duck waddle and quack), and then shuts off the motor after a time delay. Scraping and then sanding the contacts with fine emery cloth makes them conductive again. The residue on the plastic was scrapped away and the whole cover rinsed and dried. The position in which Tricky was stored (on his side) led to the battery leakage corroding an axle, seeping onto a wing feather, and ultimately eating into his cardboard box. A sampling of the hair, carpet lint, and hardened grease that needed to be painstakingly removed from various axles in the gear train. The big fake out. The orange panel does not give access to the motor, instead it narrows the openings in the wheel wells - both protecting the mechanism and children's fingers. The cap came free after it's button was snapped off. I used a razor saw to carefully cut a vertical slot through the peg's stump to allow it to separate along the same seam as the duck's body. It is hard to tell what is going on in this shot. 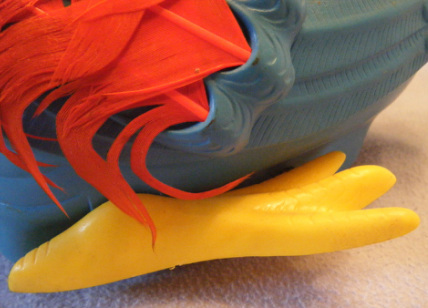 The blue rocker on the right lifts the yellow linkage that causes the duck's lower bill to open and close. The brownish, mushroomy thing in the middle is the top of the fabric bellows that generates the "quack" as the rocker arm goes up and down. Neither the bill movement or quacking action are working on our duck. Round 1 left us with a still non-functional duck - which we found unsatisfactory. Round 2 involved getting even more aggressive and completely separating the duck body to fully access all his mechanisms and electronics. We believed that the two halves were held together by a press fit post and sleeve arrangement between the duck's right and left eyes. Our second guess was that the interlocking pieces were glued together like the cap stalk. 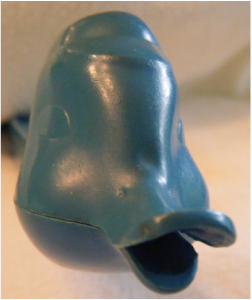 Working on the press fit assumption (the least damaging operation to the duck if true) we directed heat from a hair dryer down a funnel inserted in the duck's mouth to the join expecting the heat to differentially expand the outer sleeve and release the join. No luck. Moving on to the glue assumption, we decided to slip a coping saw blade through the mouth opening and making a clean cut severing the post and sleeve join that could eventually be re-glued together. That worked for a few millimeters and then the saw blade would no longer cut. It became apparent that the two-halves were actually screwed together and that the screw was hidden underneath an eye decal. Rather than destroy the eye decal to get to the screw, we decided to switch to an unmounted hacksaw blade and cut through the screw. 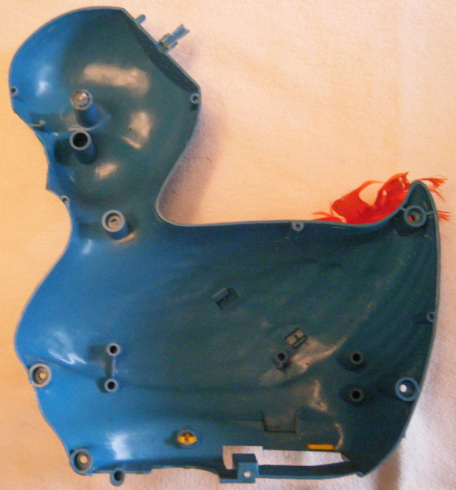 We felt it would not sacrifice the integrity of the head join when the duck was reassembled because the cap mounting arrangement also holds the head together. Once the cut was done, we had full access to the inside of the duck. As I worked on the duck, it became very obvious to me why so many Tricky Doodles are missing their battery covers. The cover is not attached to the duck, and ﻿it can only stay in place when a battery is present﻿. This created an interesting dilemma to users: either leave the battery out when the duck was not being used thereby preventing corrosion but running the risk of losing the cover OR leaving the battery in and risk damaging the innards of the duck but preventing the loss of the battery cover. Finding a used Tricky Doodle with both clean contacts AND a battery cover must be something of a miracle. 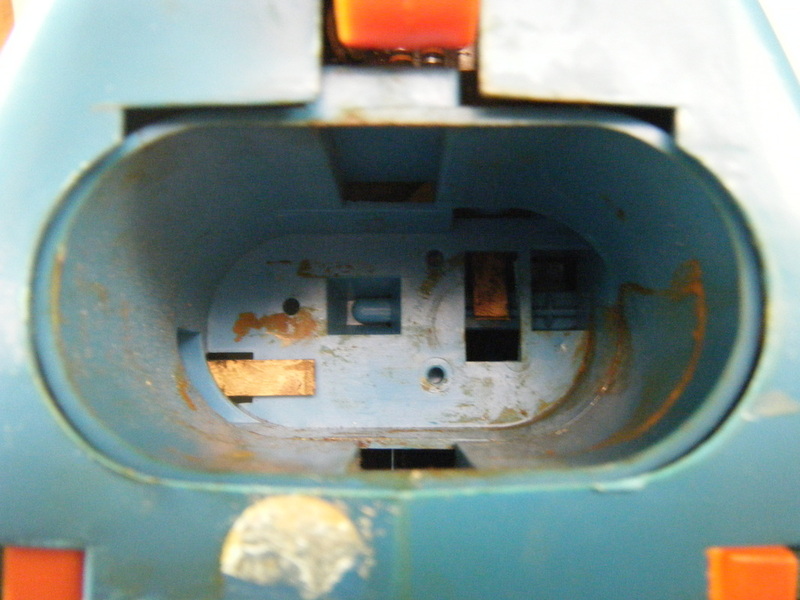 Looking inside the duck, the reddish brown battery leakage is apparent. The wings are separate pieces that have two tabs that snap into place. The yellow feet work in a similar manner. 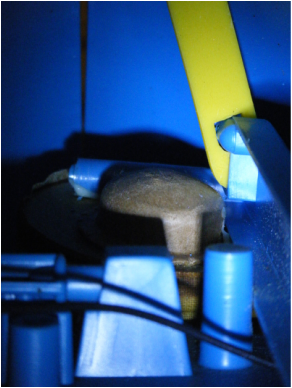 This is a top view of the mechanical platform inside the duck. The metal contacts are all badly corroded. Of particular concern is the lower left corner where two contacts press together. They don't touch flat surface to flat surface but sharp edge to flat surface which makes getting continuity difficult when corrosion is present. 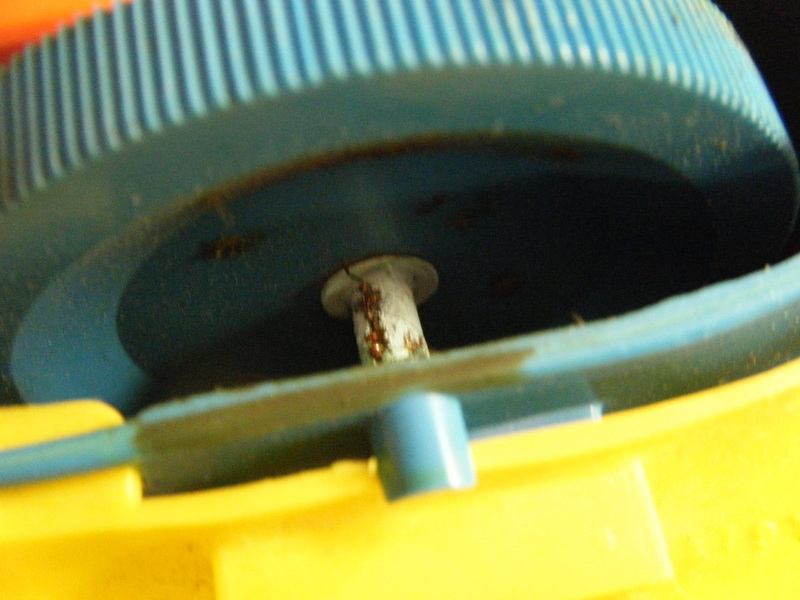 The gear train was coated with a nasty combination of hardened grease, battery leakage, and hair/lint. My sister painstakingly cleaned the gears, tooth by tooth. I put a drop of clock oil on all the metal to metal rub points. This is not a prehistoric plesiosaur hidden inside Tricky Doodle. 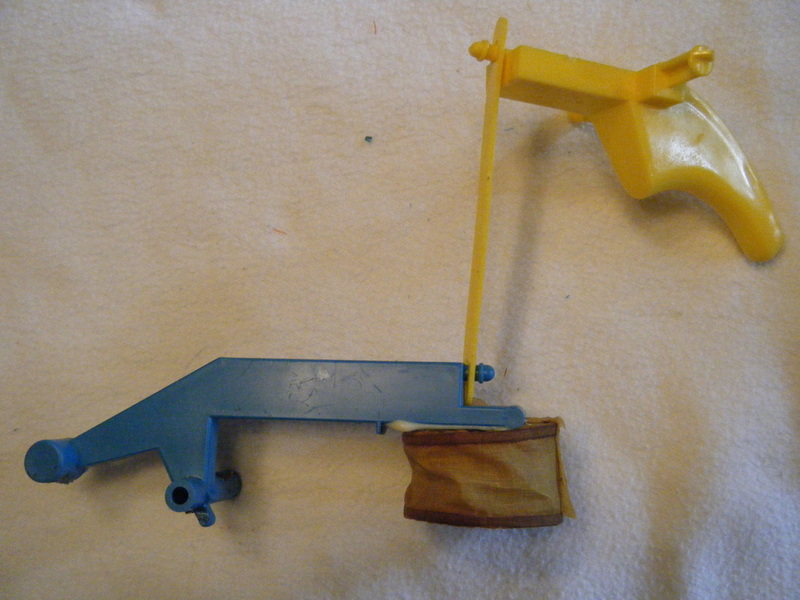 It is the lower bill (yellow), the lifter linkage (blue), and the quack generating bellows (brown). We were not getting beak movement or quaking action so this mechanism was of particular interest in our repair efforts. This is close-up of the electronics. The "holey" red piece is the microphone. The other bits are resistors, capacitors, and a transistor. Everything looked to be in good shape - no broken leads or burn marks. This half of the duck is much cleaner, which leads us to believe that the duck was stored laying on its other side; where the battery leakage is obvious and extensive. A shiny bit of screw is visible in the "eye" post. This the underside of the mechanical platform. Thankfully the circuit board that responds to the whistle and controls timing is in good shape. The battery compartment is a corroded mess and unfortunately makes use of sharp edge contacts to terminals instead of flats to terminals. The inaccessibility of the contacts in the battery well is problematic. The other side of the gunked up gear train before cleaning. Getting the gear train running smoothly will be critical to getting this heavy toy rolling and operating the bellows and beak mechanism. 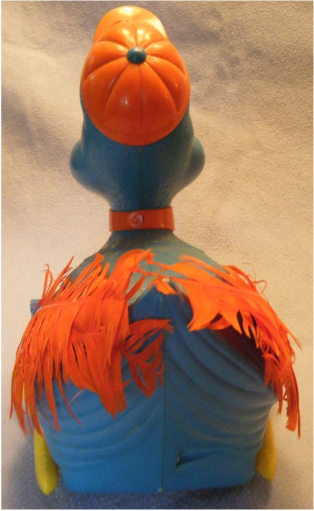 The quacking bellows is extremely problematic from a restoration perspective. The bellows is made from cardboard end caps and has a coated fabric "accordion" joining the end pieces. The top of the unit has a formed cardboard dome that houses an inaccessible flapper valve. The fabric was so hardened with age that we were afraid to compress it for fear of shattering it completely. If it broke it would be irreplaceable with another bellows because all Tricky Doodles would suffer the same problem. We decided to risk having to fabricate a new bellows and went ahead and compressed it gently. Nothing happened. After several gentle compressions with no effect, I went to town with a full compression. Quacking was restored. The long term integrity of the bellows is very doubtful and the ability of the rocker arm to compress it enough to quack is questionable. We reassembled a cleaned Tricky Doodle for testing. When activated, he moves forward about a foot and then stops. He then needs to be reactivated again. The beak moves but no quacking can be heard. His response to the whistle is sporadic and he also responds to other environmental sounds. I would like to have one more go at getting the quacking functional. I would also like to see if the duck is stopping due to a jammed cam or if he really went such a short distance with each activation. 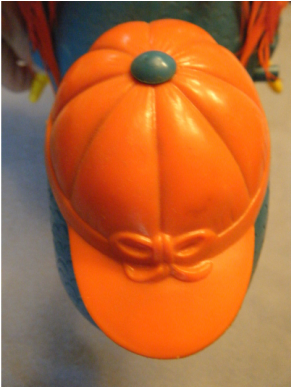 Tricky was purchased from eBay and was missing his whistle (a very common situation for the Remco sound activated toys). 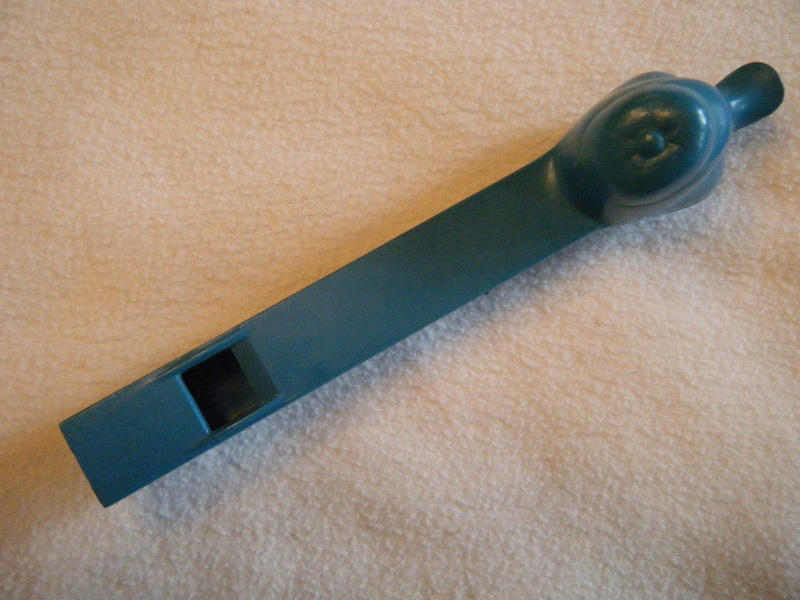 We were able to locate an original whistle by searching for duck whistles on eBay. 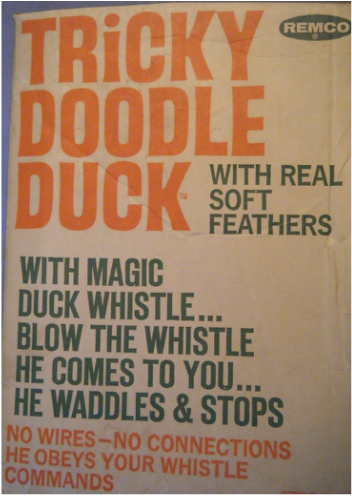 The person selling the whistle had no idea that the whistle had been connected with Tricky Doodle Duck toys. 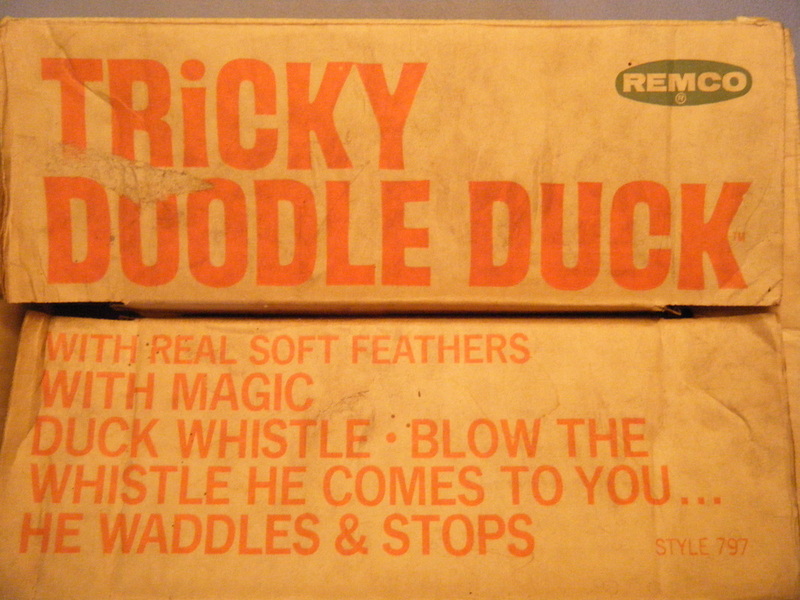 The whistle was desirable because it completed the set as well as created a sound of the correct frequency to trigger the circuitry inside the duck. Without the whistle, we would have had to experiment with other sound producing gadgets to find something that generated a usable tone. 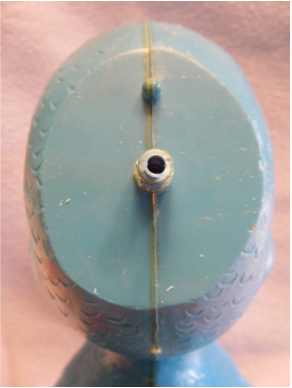 The whistle is fairly long and has a head that matches Tricky Doodle. This whistle is one color but the packaging shows two tone whistles. It should be noted that the whistle sounds like a cheap whistle and not like a duck call. The box is in fairly good shape except for the bottom right corner which is missing. 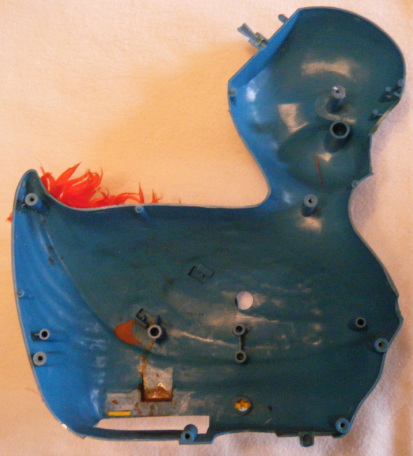 Based on the corrosion in the battery compartment, stains on the side of the duck, and the discolored and disintegrating cardboard box, we believe Tricky was stored in the box lying on its side. The leaking batteries ate through the box. Tricky came with various color combinations for his tie, hat, and whistle. This is the top of the box. 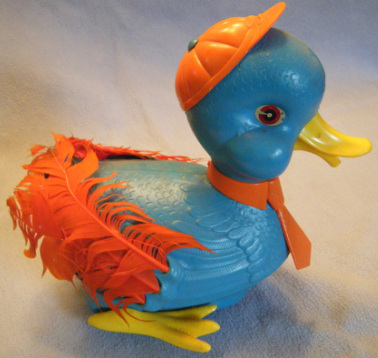 We believe that "STYLE 797" refers to a duck with a red tie and cap. 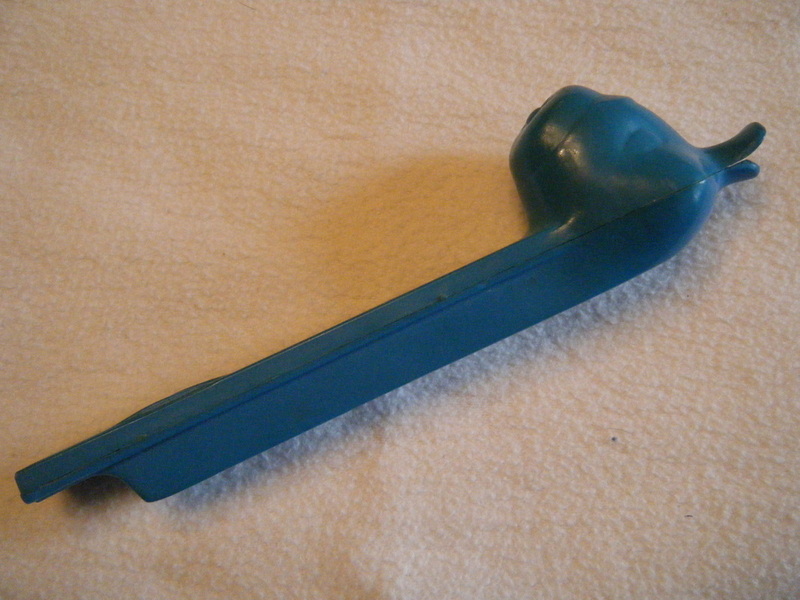 We don't know if the original whistle was two tone or a single color. The printing on the sides of the box is the same. The advertising is a little misleading - Tricky just moves when the whistle is blown, he only comes to you if you happen to be standing directly in front of him. 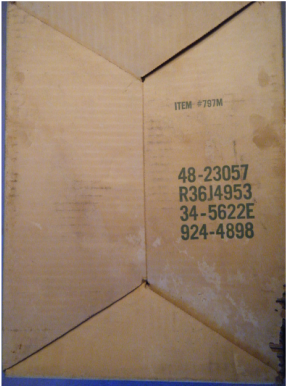 The bottom of the box.